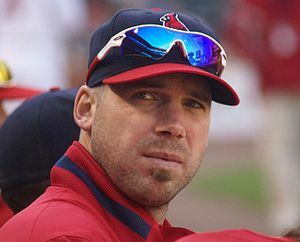 CHRIS CARPENTER PLEASE SAVE US!! Posted in: St. Louis Cardinals. Tagged: Chris Carpenter, Garcia, John Gast, Major League Baseball. When I heard RHP Chris Carpenter was trying to rehab to comeback this season, I was pretty skeptical. This guy just never quits! It was set in my mind in spring training that Carpenter’s magical career was over. But then my mind went to the current pitching staff we have and how I REALLY don’t want to break it up. Carpenter deserves it, but I didn’t want him back in the rotation. Westbrook was pitching great in his contract year, Garcia was healthy, Lynn and Miller were pumping and Wainwright looked like a true ace. Westbrook goes down with a sore arm. Okay, okay, not TOO bad. I like John Gast a lot, he pitched really well in Springfield. Westbrook is only going to miss 2 starts right? Gast deserves a shot to show his stuff, no problem. Well John Gast pitched well until he imploded late. No problem, the rest of the staff is still pitching well. Garcia hits the DL with a shoulder strain. This the the THIRD time he has had shoulder troubles in a year. He tried the rehab to avoid surgery, but like Furcal, it didn’t work. Now I’m scratching my head. In this last turn in the rotation the staff has an ERA of over 5. There is pitch count concern, and Lynn is already showing the effects. Now I look back at Chris Carpenter in a different light. 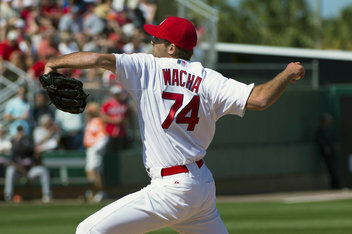 I’m not convinced the front office will call up Wacha to take Garcia’s spot for now. It’s a business decision. They aren’t going to start his clock of MLB service time until they have to. It’s probably between Kelly and Maness. I’d rather have the fire of Carpenter over both those guys. Kelly has struggled under less than ideal circumstances in the bullpen and Maness is still unproven. I’m not convinced Westbrook is close to coming back and Garcia is seeing Dr. Andrews today, that’s all you need to know about him. If Carpenter can come in before the All-Star break, it would be huge. Remember that AMAZING pitching depth? That’s why you have those guys. That’s why you hold onto them and not trade them. Each season is a roller coaster. The MLB changes fast. How will Matheny handle this?